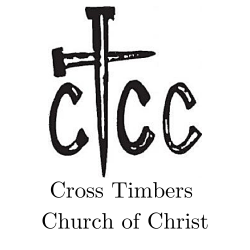 The Cross Timbers Church of Christ began meeting together in the summer of 1987. Initially around forty members met in a small store front, affectionately known to the original members as “the waterbed store”. Part of the space was walled off for a couple of children’s classrooms. This location would serve as “home” for a couple of years. In 1988, as Sunday morning attendance edged closer and closer to one hundred members in a building not nearly large enough for that many people, it was decided to begin the search for property on which to build a permanent structure. Five acres was purchased on what was at the time the edge of town, and construction began in the summer of 1989. The original structure was a multi-purpose facility, with classrooms on one side of the assembly area and kitchen, restrooms, and church office on the other. The seating could be configured multiple ways or removed completely, depending on what activity/event was taking place. Most of the work of constructing the building, other than the slab and outer framework and walls, was done by members of the Cross Timbers family. It took longer than hiring a construction company to build the structure, but it was the only economically feasible way for the structure to be built. Those who were part of Cross Timbers at the time would say that it was one of the most memorable and enjoyable times they’ve ever experienced in church life. The first official gathering was Sunday, October 1, 1989. A two-story addition was added to the initial structure in 1998 to provide more classroom and restroom space. The Cross Timbers church leans more to the “progressive” side in thought and practice. We have utilized a praise team, consisting of both men and women, for roughly twenty years. Our sisters in Christ are invited and encouraged to participate in our public gatherings by reading Scripture, and occasionally leading prayer. We typically do not have a Sunday evening gathering at the building; we gather in small groups in homes where we fellowship and study and pray for one another and those who are special to us. We actively participate in community activities that involve other churches of all community. While such practices may be much more common in Churches of Christ today that in years past, such activities as described above make us distinct from most Churches of Christ in this part of rural Texas. We believe the Bible to be the inspired Word of God. We believe Jesus Christ is the Son of God, who came to earth to rescue humanity from the consequences of sin and to give us the hope of eternal life. We believe he accomplished this by his death and resurrection from the dead. We believe he will return to the earth someday, just as he promised, and all believers will be resurrected or changed into his likeness, and will live with him and his Father and ours for all eternity. Faith in Jesus is the only way for us to experience this. We practice immersion baptism for the forgiveness of sins. We share together the Supper of the Lord every Sunday. We desire to be, as we always have, a fellowship of Christ followers who depend on the love and grace of our heavenly Father and our Lord and Savior Jesus Christ, and to manifest this love and grace in our interactions with one another and with the larger Stephenville community.